UPDATE: UWT 4.2 has been released and introduces support for Windows 10 Anniversary Update and new tweaks. It’s Anniversary celebration time! Yes, Ultimate Windows Tweaker 4 has completed 1-year and we’re releasing second big update to it. Ultimate Windows Tweaker 4.2 brings some great improvements to the tweaker along with new tweaks. The biggest change is that clicking on “Apply Tweaks” button will only apply tweaks to currently opened section. UWT 4 now fully supports Windows 10 Anniversary Update (version 1607). The tweaks which stopped working have been modified to work accurately and new tweaks have been added. Remember I released Ultimate Windows Tweaker 3 when Windows 8 was there? Now since Windows 10 is here, it needed an update and I have done it with UWT 4! 200+ tweaks in a program of size less than 1 MB. "Seeing the concerns being raised about privacy issues, several tweaks have been added under a new Privacy section." Thanks Shaun Microsoft needs to understand its users' needs and should make changes to Windows 10 for privacy concerns or it should explain us why the hell so much spying. 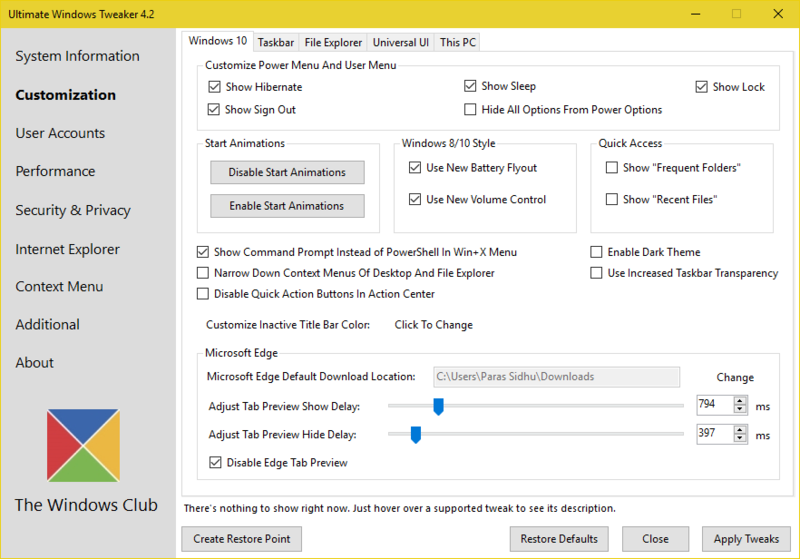 Ultimate Windows Tweaker 4.2 has been released. Please check the main post.